The Albanian Riviera and its olive and citrus plantations. Agriculture in Albania is still a significant sector of the economy of Albania, which contributes to 22.5% of the country's GDP. The country spans 28,748 square kilometres (11,100 square miles) of which 24% is agricultural land, 36% forest land, 15% pasture and meadow and 25% urban areas including lakes, waterways, unused rocky and mountain land. It can be separated into three main zones such as the lowland zone alongside the coastline of the country, the hill zone in the lowland and the mountain zone. The country encompasses coastal plains in the west to the Albanian Alps in the north, the Sharr Mountains in the northeast, Skanderbeg Mountains in the center, Korab Mountains in the east, Pindus Mountains in the southeast and Ceraunian Mountains in the southwest along the Albanian Riviera. The Mediterranean Sea, which includes the Adriatic and Ionian, makes up the entire west border of Albania. The country experiences mostly mediterranean climate with continental influences. That means that the climate is characterised by mild winters and hot, dry summers. The warmest areas of the country are along the west, where climate is profoundly impacted by the sea. The coldest parts of the country are at the north and east, where snowy forested climate is prevalent. In 1990, domestic farm products accounted for 63% of household expenditures and 25% of exports. As part of the pre-accession process of Albania to the European Union, farmers are being aided through IPA funds to improve the Albanian agriculture standards. As of the Ministry of Agriculture the exports of vegetables and fruits have doubled over the first months of 2017. However, the exports of fish, seafood and marine products have also increased by 35 percent. One of the earliest farming sites in Europe has been found in Southeastern Albania. A mussel cultivation facility in Lake Butrint. Both the Adriatic and Ionian Sea inside the Mediterranean Sea are a source of salt water fishing, while fresh water fishing occurs on Lake Butrint, Lake Shkodër, Lake Ohrid, Lake Prespa as well as in Karavasta Lagoon, Narta Lagoon and Patos Lagoon. The country's coast is estimated to be 381 kilometres (237 mi) long. The country's great availability of water gives the underdeveloped fishing industry great potential to become a major part of the local economy. Although the fishing industry is still in a transition process despite significant development and processing capacities inherited from the past. Fish farming in Zus, Shkodër County. Extensive marine fish cultivation has been practiced in the country in the 1950s. The marine finfish industry is an inshore and offshore sea cage-farming sector. Trouts are developed mainly in the southeast, southwest and north, while carps are primary found in the center and north. Marine finfish culture is dominated by species including rainbow trout, european bass, gilt-head bream, common carp, silver carp, bighead carp, grass carp and ohrid trout. Mussels are widespread throughout the south of the country and particularly cultivated in Lake Butrint along the proximity to the Ionian Sea. In 1980, almost 80 mussel cultivation facilities were constructed with an average production of about 2,000 tonnes per year, while in 1989 it increased to 5,000 tonnes per year. Although in Shëngjin operates as well a smaller facility of about 100 hectares. Following the end of communism and outbreak of cholera in 1990, the production declined sharply and opened again in 2000. The cultivation of shrimps began around the end of communism in Albania. The country's only extensive shrimp cultivation facility is located in Narta Lagoon, whence the Vjosa River drains into the Adriatic Sea. Within the Karaburun-Sazan Marine Park, there has been 50 species of crustaceans recorded which indicates that the region is a potential location for cultivation. Albania is the 42nd largest producer of wine in the world. The country has one of Europe`s longest history of viticulture and belongs chronologically to the old world of wine producing countries. The most important wine regions of the country are located in the center but also the mountainous areas in the north, east and south. Following the end of communism in the 20th century, the development and fortunes of the Albanian wine industry were deeply influenced by the economic influences of the country. In 1912, gained widespread popularity among the local population but was almost destroyed in 1933 by phylloxera. A significant upturn began only after the Second World War, at the end of which wine was still cultivated on only 2,737 hectares (27.37 km2). The most producing region of wine was Durrës County, where grapes was grown on communist state enterprises. In that time the nationwide acreage corresponded approximately to that of tobacco, but was significantly lower than that of olive and fruit trees. The exported wine was consumed primarily in Western Europe such as in Germany. Moreover, the exports of wine decreased continuously from 61,000 hectoliters in 1971 to 22,000 hectoliters in 1985. The reasons are to be found mainly in outdated production conditions and insufficient technical material that made it difficult to transport and lowered the quality. On the other hand, the export of easily transportable graisins was continuously in increase (up to 3500 tons per year), while the export of fresh grapes was marginal. The main agricultural products in the country are tobacco, figs, olives, wheat, maize, potatoes, vegetables, fruits, sugar beets, grapes, meat, honey, dairy products, and traditional medicine and aromatic plants. Agriculture accounts for 18.9% of the GDP and a large portion of the exports. However, it is limited primarily to small family operations and subsistence farming because of lack of modern equipment, unclear property rights, and the prevalence of small, inefficient plots of land. The post-1990 land fragmentation, uncertain land ownership, lack of state registries and bank crediting, and high VAT are all obstacles to a modern agricultural industry. There is also a concern that agricultural products originating from Albania are being stamped as 'Product of Turkey' for the international market. The agricultural scene is gradually changing with the introduction of cooperatives, foreign investment, farmer formalization, and the construction of collection and distribution centers. Albania has soils and a climate favorable to an extensive lumber industry. Many of the historic forests of Albania were destroyed with inefficient wood industry and expanse of agricultural land in the 1990s. Today, forests cover about one third of Albania's land area and, due to an agreement with Italy and the World Bank, there is a large amount of reforestation underway. Albania is the 11th largest producer of olive oil. Albania produces a wide variety of fruits, nuts and vegetables, while its production is constantly growing. 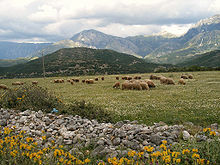 Wikimedia Commons has media related to Agriculture in Albania. Muller, Daniel and Thomas Sikor. "Effects of Post-Socialist Reforms on Land Cover and Land Use in South-Eastern Albania." Applied Geography 26, no. 3-4 (2006):175-191. Levene, David (1 January 2013). "Albania's chestnut, cheese and pasta workers". The Guardian. LeBlanc, Tyler (26 December 2014). "Albania Mania: Perfect beaches, mountain hikes and truly local food. Packing yet?". Modern Farmer. ^ Food and Agriculture Organization. "Albania: FAO Country Programming Framework in the Republic of Albania 2015-2017" (PDF). fao.org. p. 7. ^ Prof. Andrea Shundi. "Albania". fao.org. ^ Ministry of Environment of Albania. "Albania's Second National Communication to the Conference of Parties under the United Nations Framework Convention on Climate Change" (PDF). unfccc.int. Tirana. p. 28. ^ "IPA National Programme 2011 for Albania Project Fiche 7: Support to Agriculture and Rural Development" (PDF). Retrieved 17 June 2016. ^ agroweb (26 April 2017). "Dyfishohet eksporti i fruta-perimeve, 3-fishohet ai i vezëve". agroweb.org (in Albanian). ^ "UC Research Reveals One of the Earliest Farming Sites in Europe". Uc.edu. 2012-04-16. Archived from the original on 2015-09-10. Retrieved 2016-06-17. ^ Sustainable Development of Sea-Corridors and Coastal Waters: The TEN ECOPORT project in South East Europe (Chrysostomos Stylios, Tania Floqi, Jordan Marinski, Leonardo Damiani ed.). Springer. 2015-04-07. p. 85. ISBN 9783319113852. ^ Aleksander Flloko. "Fish marketing and trading in Albania" (PDF). faoadriamed.org. p. 5. ^ Center for International Development, Harvard University. "INCREASING EXPORTS OF ALBANIAN CULTIVATED FISH TO THE EU" (PDF). growthlab.cid.harvard.edu. ^ "Organic Agriculture in Albania" (PDF). orgprints.org. p. 7. ^ University of British Columbi (2 July 2017). "Reconstruction of Albania fishery catches by fishing gear" (PDF). seaaroundus.org. p. 2. Archived from the original (PDF) on 2017-07-02. ^ a b c Food and Agriculture Organization. "Albania". fao.org. ^ Viola Prifti and Fan Noli University. "ARTIFICIAL FERTILIZATION OF THE OHRID TROUT AND THE PRESENCE OF ITS SUMMER FORM IN THE LAKE" (PDF). animalsciencejournal.usamv.ro. ^ a b c Center for International Development, Harvard University. "CONDITIONS FOR RE-OPENING EXPORTS OF ALBANIAN MUSSELS TO THE EU" (PDF). albania.growthlab.cid.harvard.edu. p. 4. ^ Aleksi Pëllumb; Ceschia Giuseppe; Sulaj Kapllan. "First report of Marteiliosis in Mytilus galloprovincialis in Albania" (PDF). sipi-online.it. ^ D Greco; I Luizzi; A Sallabanda; A Dibra; E Kacarricy; L Shapo. "Cholera in the Mediterranean: outbreak in Albania". eurosurveillance.org. ^ Lefter KASHTA; Sajmir BEQIRAJ; Virginie TILOT; Violeta ZUNA; Eno DODBIBA. "THE FIRST MPA IN ALBANIA, SAZANI ISLAND – KARABURUNI PENINSULA, AS A REGIONAL PRIORITY CONSERVATION AREA FOR MARINE BIODIVERSITY" (PDF). zrsvn.si. p. 9. ^ PATTI MORROW (5 January 2017). "Why Albania Is A Great Destination For Wine Drinkers". epicureandculture.com. ^ The Oxford Companion to Wine (Julia Harding, Jancis Robinson ed.). Oxford University Press, 2015. ISBN 9780198705383. ^ The Sotheby's Wine Encyclopedia (Tom Stevenson ed.). London: Dorling Kindersley. 2005. ISBN 0-7566-1324-8. ^ Oxford Companion to Wine (Jancis Robinson ed.). Oxford: Oxford University Press. 2015. p. 10. ISBN 9780198705383. ^ Petraq Ilollari (Sotiri) (2010). Vitis Vinifera në vendin tonë/Vitis Vinifera in Our Country. pp. 8–13. ^ "Top 25 Olive Oil Producing Countries". ^ "COMPETITIVENESS OF ALBANIAN AGRICULTURE: VALUE CHAIN ANALYSIS FOR FRUITS AND VEGETABLES SUB-SECTOR IN FIER REGION" (PDF). ifama.org. ^ "Plums and sloes, production quantity (tons) - for all countries". ^ "Grapes, production quantity (tons) - for all countries". ^ "Watermelons, production quantity (tons) - for all countries". ^ "Fruits without melons, total, production quantity (tons) - for all countries". factfish.com. ^ "Figs, production quantity (tons) - for all countries". factfish.com. ^ "Cucumbers and gherkins, production quantity (tons) - for all countries". factfish.com. Roughly one-third of Iran's total surface area is suited for farmland, but because of poor soil and lack of adequate water distribution in many areas, most of it is not under cultivation. Only 12% of the total land area is under cultivation but less than one-third of the cultivated area is irrigated; the rest is devoted to dryland farming. Some 92 percent of agricultural products depend on water. The western and northwestern portions of the country have the most fertile soils. Iran's food security index stands at around 96 percent. Agriculture in Kyrgyzstan is a significant sector of the economy. According to the CIA World Factbook, it comprises 18% of the total GDP and occupies 48% of the total labor force. Only 6.8% of the total land area is used for crop cultivation, but 44% of the land is used as pastures for livestock. Because of the many mountains of Kyrgyzstan, animal husbandry remains a significant part of the agricultural economy. Agriculture in Kazakhstan remains a small scale sector of Kazakhstan's economy. Agriculture's contribution to the GDP is under 10% - it was recorded as 6.7%, and as occupying only 20% of labor. At the same time, more than 70% of its land is occupied in crops and animal husbandry. Compared to North America, a relatively small percentage of land is used for crops, with the percentage being higher in the north of the country. 70% of the agricultural land is permanent pastureland. Agriculture in Israel is a highly developed industry. Israel is a major exporter of fresh produce and a world-leader in agricultural technologies despite the fact that the geography of the country is not naturally conducive to agriculture. More than half of the land area is desert, and the climate and lack of water resources do not favor farming. Only 20% of the land area is naturally arable. In 2008 agriculture represented 2.5% of total GDP and 3.6% of exports. While farmworkers made up only 3.7% of the work force, Israel produced 95% of its own food requirements, supplementing this with imports of grain, oilseeds, meat, coffee, cocoa and sugar. Agriculture employs the majority of Madagascar's population. Mainly involving smallholders, agriculture has seen different levels of state organisation, shifting from state control to a liberalized sector. Armenia has 2.1 million hectares of agricultural land, 72% of the country's land area. Most of this, however, is mountain pastures, and cultivable land is 480,000 hectares, or 16% of the country's area. In 2006, 46% of the work force was employed in agriculture, and agriculture contributed 21% of the country's GDP. In 1991 Armenia imported about 65 percent of its food. Agriculture in Portugal is based on small to medium-sized family-owned dispersed units; however, the sector also includes larger-scale intensive farming export-oriented agrobusinesses backed by companies. The extent of cooperative organisation has been reaching a greater importance with globalization. Portugal produces a wide variety of products, including green vegetables, rice, corn, wheat, barley, olives, oilseeds, nuts, cherries, bilberry, table grapes and edible mushrooms. Forestry has also played an important economic role among the rural communities and industry. In 2013, the gross agricultural product accounted for 2.4% of the GDP. Portugal is one of the world's largest producers of wine and cork. The land area of slightly more than 9.2 million hectares was classified as follows : 2,755 arable land and permanent crops, 530 permanent pasture, 3,640 forest and woodland, and 2,270 other land. Agriculture in Morocco employs about 40% of the nation's workforce. Thus, it is the largest employer in the country. In the rainy sections of the northwest, barley, wheat, and other cereals can be raised without irrigation. On the Atlantic coast, where there are extensive plains, olives, citrus fruits, and wine grapes are grown, largely with water supplied by artesian wells. Morocco also produces a significant amount of illicit hashish, much of which is shipped to Western Europe. 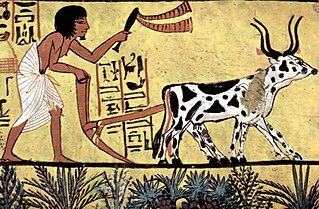 Livestock are raised and forests yield cork, cabinet wood, and building materials. Part of the maritime population fishes for its livelihood. Agadir, Essaouira, El Jadida, and Larache are among the important fishing harbors. Agriculture in Spain is important to the national economy. Agriculture in South Africa contributes around 10% of formal employment, relatively low compared to other parts of Africa, as well as providing work for casual laborers and contributing around 2.6 percent of GDP for the nation. Due to the aridity of the land, only 13.5 percent can be used for crop production, and only 3 percent is considered high potential land. 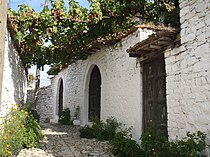 The Albanian wine is produced in several regions throughout Albania within the Mediterranean Basin. The country has one of the oldest wine making traditions, dating back to the ice and bronze age whereas Ancient Illyrians and Greeks inhabited the country's territory some 3,000 years ago. It belongs chronologically to the old world of wine producing countries. Coffee production in Jamaica began after 1728, when governor Sir Nicholas Lawes introduced the crop near Castleton, north of Kingston. Jamaican Blue Mountain Coffee is the special variety of coffee that is grown in the Blue Mountains region, which has the most conducive climate and topographical features; this variety is known for its scent and sweet taste. Most of Jamaica's coffee production is grown for export.